Australian adopted Vietnamese Catherine Turner found her biological mother through using her birth certificates records of her own birth date and that of her mothers. A former World Vision child, she happily reunited with her biological mother in March 2003, accompanied by her adoptive parents. Catherine is currently working on documenting this project and editing video footage she took of this amazing and inspiring event. 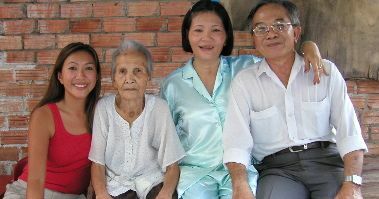 Photo: Reunited – Catherine with her Vietnamese grandmother, mother and step father. Excerpts from Catherine: I grew up in a small country town where I was one of about 3 Asians. While I felt isolated and frustrated at my differences many times, I always had the immense support of my adoptive family, which constantly told me I was special, I was unique and I should be proud to be Vietnamese and proud of my ancestors. As a young girl and teenager it is not always what you want to hear, but hear it often enough and I started to believe it – though not till my early 20s. I have been to Vietnam once before to meet someone who we thought was my mother but wasn’t. Then I returned in March 2003 after the happiest time in my life! I managed to track my real Vietnamese mother down…My mother is gorgeous, kind, gentle, beautiful and best of all sheloves me and has thought about me for 28 years! It truly is destinythat we discovered one another. We are now both at the beginning of avery exciting time of our lives: getting to know one another.